Kit Carruthers (Martin Sheen) is the most placid serial killer you could ever hope not to meet, his affable politeness as sincere and unaffected as his murderous explosions. Kit kills just about anyone who gets in his way, but he does so barely a hint of malice. Or remorse. It couldn't be any other way. Everyone Kit encounters is merely an anonymous supporting character in the grand myth he has written for himself, a self-aggrandizing narrative crafted to transform a fired garbage collector into a very important person, a legend in life and his impending death. His victims have no interior lives in his eyes; they are all just “Bystander #1” whose deaths don't even register. Only one other person matters at all in Kit's world, his teenage girlfriend and fellow fugitive Holly (Sissy Spacek), but it's fair to wonder whether he feels anything for her or merely views her as a necessary accessory in his slipshod story; the girl, as Holly observes, destined to cry out Kit's name as he is gloriously gunned down by Johnny Law. It's only appropriate then that director Terrence Malick reminds us that the natural world is similarly unconcerned with Kit and his adventures. The young couple traverses a breathtakingly beautiful mid-Western landscape (set in South Dakota and Wyoming, but filmed in Colorado) with the recent film school graduate indulging his deep-focus fetish at every opportunity with a series of sweeping panoramas that unfurl to the distant horizon, vistas simultaneously featureless and spectacular. Water burbles along streams, insects buzz and feed, all oblivious to Kit's drama, even as his killing spree terrorizes the local populace and mobilizes a massive manhunt. Kit might think he's the new James Dean; the universe cannot be bothered to shrug its shoulders. Werner Herzog, you have a soulmate. “Badlands” (1973) is loosely inspired by real-life serial Charles Starkweather and his teenage companion Caril Ann Fugate, who stunned the nation with a nine-day rampage that resulted in ten murders, including the stabbing of Caril's two year-old sister. Malick, who also wrote the screenplay, pulls off a remarkable balancing act in a feature debut sensitive to the rhythms of its cold-blooded protagonists without romanticizing them. The camera attends to the expressions and especially the movements of the characters; the freckle-faced gamine Holly twirls her baton with effortless grace, anticipating the pirouetting Pocahontas (Q'orianka Kilcher) and the receding circular trajectory traced by Mrs. O'Brien (Jessica Chastain) in subsequent Malick films. Both Sheen and Spacek, each comfortably playing about seven years younger than their true ages, wear the looks of pure, wide-eyed innocents (childlike innocence and casual amorality being strongly correlated) who may not quite be in love but are, at least, in this big ol' thing together, which may be the most either can hope for. This tender treatment does nothing to alleviate the horror of the atrocities committed. Indeed, the tension is almost unbearable at times, particularly in a sequence (also inspired by Starkweather's exploits) in which Kit and Holly invade a rich man's home for supplies (“easier than shopping downtown”) and a much-discussed scene in which Kit quite matter-of-factly leads a young, unlucky couple into a storm cellar. While Kit certainly hones the image he wants to project, it's both remarkable and disturbing to witness his lack of pre-meditation. Many of the killings happen so abruptly we might want to take Kit at his word when asked to explain why he shot somebody: “I don't know.” He acquires and discards a series of objects throughout the film, changing his mind about their relative importance on a whim. He spins a bottle to determine what direction to follow next, doesn't like the result, looks for a flatter spot to spin it again, then abandons the idea because it has now ceased to interest him. Holly loses interest in the proceedings as well. The film is framed by her constant narration, presented in the overwrought style of a confessional romance (“I Rode With A Killer!”) but delivered almost entirely without affect, one of the film's many paradoxical qualities. Initially, she is excited by the prospect of frightened townsfolk cowering in the couple's wake, but she soon grows bored with day-to-day life on the lam. Even an older man who is “handsomer than anybody I'd ever met” starts to lose his charm when you can't find anywhere to take a bath or get a decent meal. The narration provides Holly her own shot at mythmaking, absolving herself of blame but with a narcissistic tone that invites further skepticism. In evaluating her by the end, it's difficult to forget an early scene when the sweet little naif tosses her pet catfish in the backyard to suffocate after it gets sick and, presumably, becomes too much of a nuisance to care for anymore. Is there any reason to expect her to treat Kit differently? 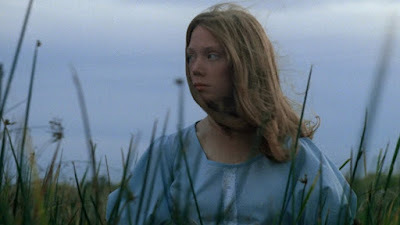 The film is presented in its original 1.85:1 aspect ratio, and the new 4K digital transfer is “approved by Terrence Malick.” The film was previously only available on North American region DVD on a middling SD by Warner Brothers released in 1999. 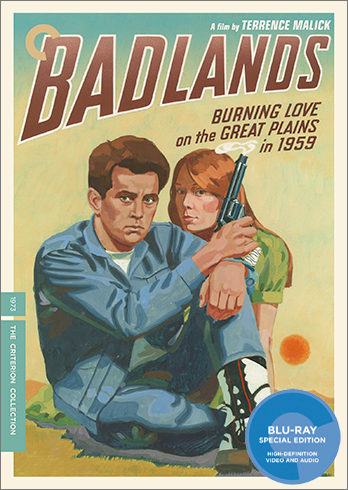 It's a genuine pleasure to watch “Badlands” in 1080p and if it is not quite the revelation of Criterion's Blu-ray release of “Days of Heaven” in 2010, it's still a major improvement. I was particularly struck by an early scene where Holly twirls her baton in the front yard of her small-town suburban home. In high-def, this scene is bathed in sunlight with subtle and radiant colors; the shot is so suffused with nature it is almost super-natural. Shots of the rolling plains are similarly buoyant and the image detail is sharp throughout and the fine grain structure has been well-preserved. An excellent transfer by any standard. The linear PCM Mono audio track is surprisingly rich and does justice both to the brilliantly employed “Musica Poetica” by Carl Orff and Spacek's drawling, lilting narration. There is no sign of distortion of any kind. Optional English subtitles support the English audio. The Warner Brothers SD had no special features, and this criminal oversight has been addressed by Criterion. Sorry, folks, you're not getting a Malick commentary or a Malick interview, but you do get an excellent collection of interviews. “Making 'Badlands'” (41 min.) is a 2012 feature by Criterion that combines interviews with Sheen, Spacek, and art director Jack Fisk (Spacek's husband; they fell in love on the set of “Badlands.”) There's quite a bit of interesting information from each of the three subjects. Sheen relates that he told Malick he loved the script but was simply too old for the role; Malick promised to re-write it to suit Sheen. They also talk about a major accident that occurred on set during the filming of a house fire. The disc also includes a 2012 interview with Edward Pressman (12 min.) which isn't great, but does relate the amusing fact that Warner Brothers previewed “Badlands” on a double feature with “Blazing Saddles.” A 2012 interview with editor Billy Weber (22 min.) is very informative. Weber also edited “Days of Heaven” and “The Thin Red Line” and has plenty to say about his working relationship with Malick. Criterion has added on a 1993 episode of “American Justice” (21 min.) about the Starkweather killings, though the episode focuses more on the case against his young girlfriend Caril Ann Fugate. It's filler material, but a quick and easy way to get the basics of the case. A Trailer (3 min.) in somewhat rough condition rounds out the collection. The 20-page insert booklet has beautiful portraits of Sheen and Spacek on the front and back covers and features an essay by filmmaker Michael Almereyda. 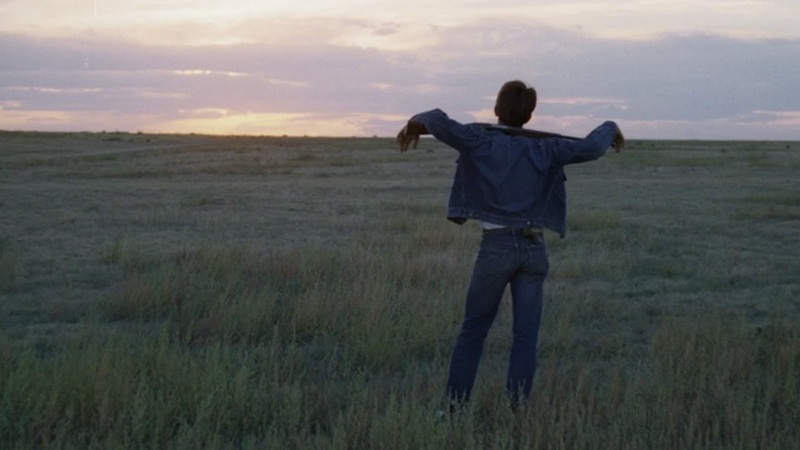 “Badlands” is a remarkable debut feature by one of the most remarkable American filmmakers of the last half century. It received mixed reviews during its initial run but after Malick released “Days of Heaven” in 1978, critics were ready to crown him the next great visionary. And some of them did, but they also had nothing else to do as they waited another twenty years for his third film, “The Thin Red Line.” Malick has suddenly become prolific as he glides gracefully through his seventies. Some critics think he has tottered over the (thin red) line into self-parody with his most recent works. On the other hand, those of us who know what we're talking about recognize him as the greatest American filmmaker still working today.